Victor Vasarely was an eminent Hungarian painter, best known as a father and founder of Op Art movement. His unbelievably complex and colorful patterns engage the viewer’s eye and convey a sense of kinetic energy across the two-dimensional surface. During the 1960’s and 70’s, Victor Vasarely’s optical images became a new indispensable part of the popular culture. They made a strong impact on architecture, computer science, and even fashion. Despite the fact that Vasarely has achieved a worldwide success, he remained quite modest and insisted on keeping his art accessible to everyone. His main motto was Art for All. Vasarely’s life and biography were quite exciting and full of unexpected choices. The artist was born in 1906 in Pecs, Hungary and he was initially quite passionate about natural science, especially medicine. Accordingly, he decided to dedicate himself to medicine studies at the Budapest University. However, in the late 1920s, he suddenly changed his mind and abandoned medicine in order to start learning traditional academic painting. Around the same time, he enrolled at the private Podolini-Volkmann Academy. In 1928, he became a regular visitor of Sándor Bortnyik’s workshop and gallery, which was the very center of Bauhaus movement in Vasarely’s home country. While spending time at this gallery, Vasarely got interested in the work of Wassily Kandinsky. He also felt that his home country might not be the most stimulative environment for a young artist, so he moved to Paris and settled there in 1930. He supported himself financially by his work in the field of graphic arts, such as poster designing. He also used to collaborate with various advertising agencies, as a creative consultant. Already at this early point of his career, Vasarely showed enviable skills when it comes to combining patterns and organic images. He preferred working alone and his interactions with other artists were quite limited in this period. 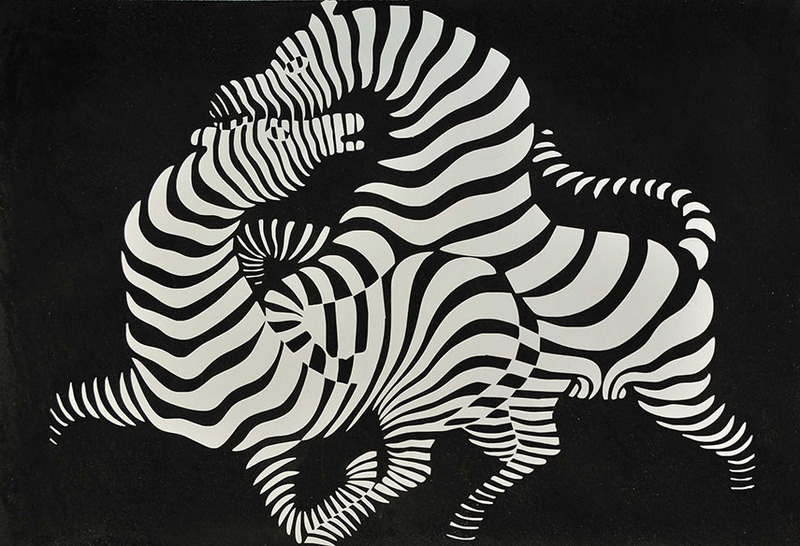 Vasarely’slegendary work from the 30s, entitled Zebra, is nowadays considered as one of the earliest examples of op art. It was also a really important departure point in Vasarely’s development of his own style. Over the next thirty years, the artist has created his very own style, consisting of geometric abstract art based on a minimal number of forms and colors. Earlier Vasarely’s pieces revolved around the concepts of color theory but in the 1950s and 1960s, his work became more independent because it started focusing on the optical potential of the two-dimensional view. The artist was also puzzled by the internal geometry present in the natural, organic world and many of his common motifs are rooted in these natural sources of geometry. Since Vasarely’s art turned out to be quite successful in the financial sense as well, the artist has used his income to establish a socio-cultural foundation in Aix-en-Provence in France. The main goal of this institution was the integration of beauty at all levels of the urban environment. Victor Vasarely’s oeuvre consists of paintings and sculptures based on the principles of optical illusions. Over the three decades, the artist has produced a number of quite different series, which confirms the strength and versatility of his talent. Starting from the late 20s until the mid-40s, Vasarely experimented with textural effects, perspective, shadow and light. His most famous works from this period are Zebras from 1937, Chess Board from 1935, and Girl-power from 1934. This period was followed by Victor Vasarely’s further experimentation with cubistic, futuristic, expressionistic, and surrealistic paintings, made in the mid-40s. Afterward, he suddenly felt he on the wrong track, but in spite of this he exhibited his pieces in the gallery of Denise René in 1946 and the gallery René Breteau in 1947. However, it wasn’t until the 50s that Vasarely has developed his very own style. The names and ideas behind his works produced in this period came from various geographic locations. Denfert is inspired by the white tiled walls of one of the metro stations in Paris, while Gordes/Crystal is related to the cubic shape of houses close to the Cote d’Azur. Based on the imagery from his Gordes series, the artist started developing his trademark kinematic images. These were made on acrylic glass panes and due to their modern and light structure, they suggested a dynamic atmosphere. When it comes to his black and white paintings, Vasarely used to combine the frames into a single pane by transposing photos in two colors. 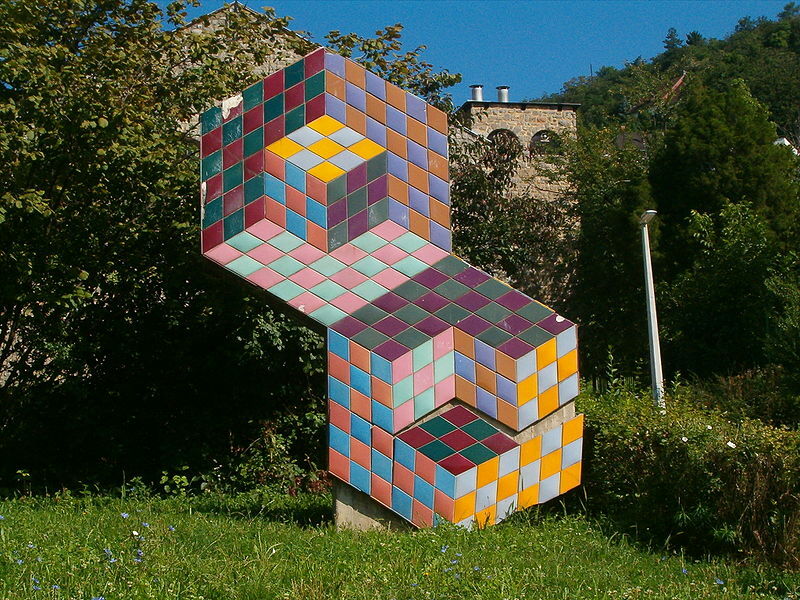 During the mid-50s, Vasarely made some of his best pieces, such as his famous Tribute to Malevitch, which is a large ceramic wall placed at the University of Caracas in Venezuela. This beautiful masterpiece was co-designed with the architect Carlos Raúl Villanueva. Generally speaking, around the same time kinetic art became really popular and it truly flourished thanks to Vasarely but also his fellow artists such as Marcel Duchamp and Man Ray. In order to thoroughly explain his innovative artistic approach, Victor Vasarely has written and published his Yellow Manifest. This writing was based on his research of constructivist and Bauhaus pioneers. 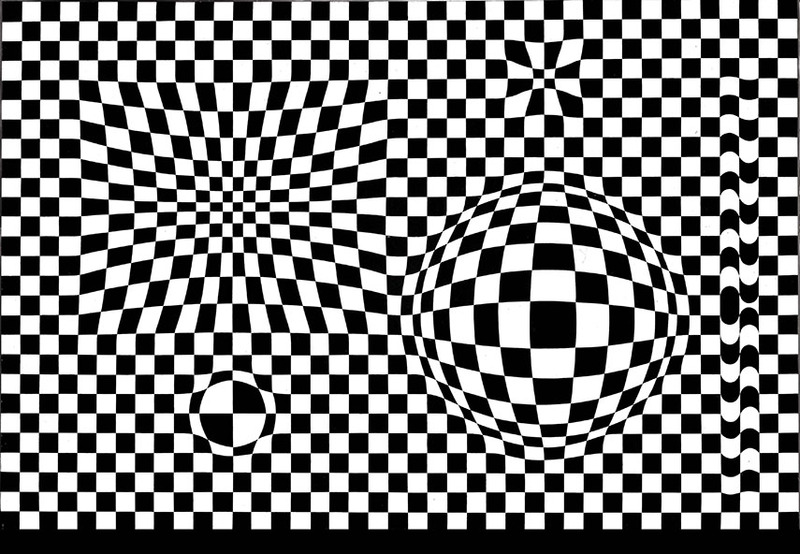 Vasarely clarified that his term visual kinetics refers to the perception of the viewer since the viewer is also the perceiver of optical illusions. After he published this manifesto, Vasarely dedicated himself to another series of works, called Folklore Planétaire, Permutations and Serial Art. This series is typical for its usage of unités plastiques – these are various permutations of geometric forms. In this interesting, almost scientifically organized series, Vasarely has worked with a clearly limited palette. For instance, three shades of red, three shades of greens, two violets and two yellows, but he also restricted his choice of shapes – he used just three circles, two squares, two rhomboids, two rectangles, one triangle, and so forth. 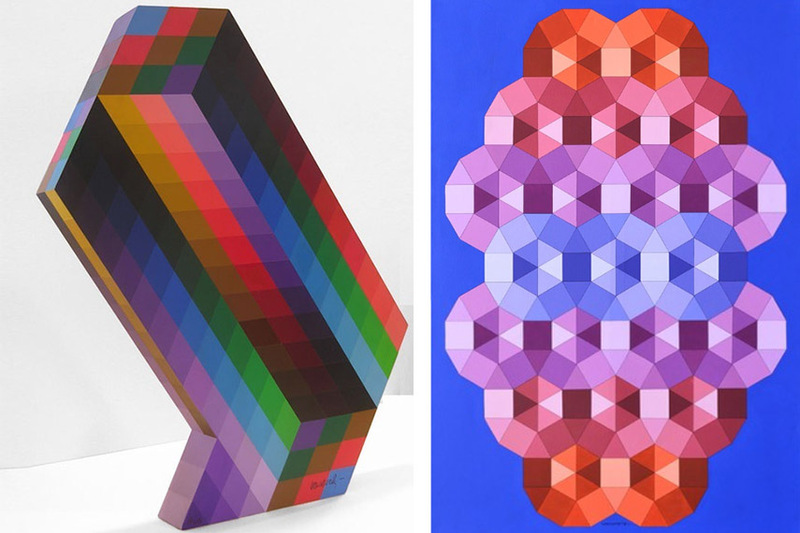 Finally, in 1965, Victor Vasarely completed another major series, called Vega: The Tribute to the Hexagon. This series consists of numberless transformations of colors and shapes. Vega has received a great public recognition and was included in the Museum of Modern Art exhibition The Responsive Eye. The most common optical illusion used in this series is the illusion of volume created by the use of swelling grids. In 1970, Vasarely has opened a museum containing over 500 of his works , in a beautiful palace in Gordes. Unfortunately, the museum got closed in 1996. The artist came to another similar idea and it was to open the Foundation Vasarely in Aix-en-Provence. This project was inaugurated in 1976 by Georges Pompidou, but nowadays it is also abandoned, due to water leakage from the ceiling. When it comes to other Vasarely’s public projects, in 1976 his large-scale kinematic pieces called Georges Pompidou was installed in the Centre Pompidou in Paris. 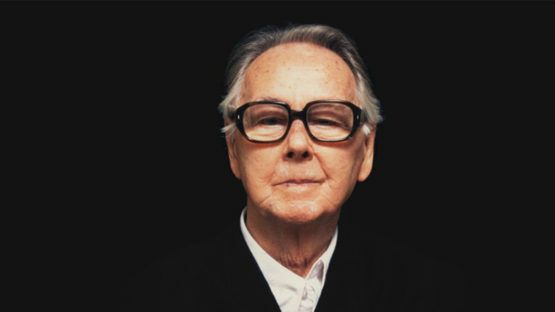 During the same decade, Vasarely showed a strong interest in the industrial design and he collaborated on the production of an upscale Suomi tableware. In 1982, Vasarely’s work was still quite popular and more than 150 of his unique serigraphs were taken into space by the French-Soviet spacecraft Salyut 7. Later, the same cosmic pieces were sold for the benefit of UNESCO. Around the end of the 80s, the second Vasarely museum was opened, this time in the artist’s native Budapest. Vasarely died in 1997 in Paris when he was 90 years old. Victor Vasarely’s contribution to the world of contemporary art is indispensable – his kinetic visual experiments had enough power to transformed flat surfaces into dynamic realms of endless possibilities. Thanks to his bold and pioneering approach, Vasarely had bookmarked an entire era in the history of art. In a way, he was also an early bid when it comes to programming, the Internet and digital arts. Nowadays Vasarely is represented by major international museums and galleries and he has received many artistic and honorary awards. Among these important distinctions are the French Legion of Honor, the Guggenheim Prize, and the Gold Medal of the Triennale in Milan. The artist is represented by Galerie Thalberg in Zurich, Gregg Shienbaum Fine Art in Miami and The Jane Kahan Gallery in New York. Victor Vasarely lived and worked in France.